Front national president Viresh Shandilya said he has "insulted" the country with his pro- Pakistan remarks and was speaking "against" the RSS. 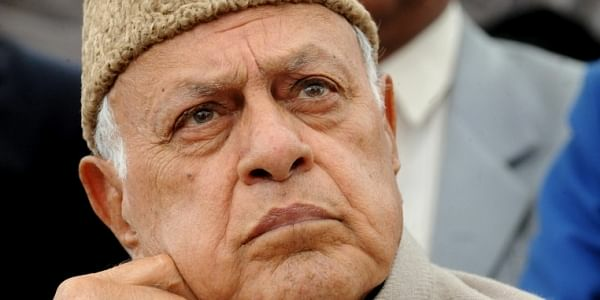 CHANDIGARH: The Anti Terrorist Front India today announced a bounty of Rs 21 lakh prize for cutting former Jammu and Kashmir chief minister Farooq Abdullah's tongue, saying he has "insulted" the country with his pro- Pakistan remarks and was speaking "against" the RSS. "Farooq has been speaking against the RSS and supporting Pakistan and insulted India in his recent remarks," he said in a statement here. "Farooq is a big traitor in India and the central government should withdraw Z plus security from him. I will award Rs 21 lakh to the person who cuts Farooq's tongue," he said. Recently, Abdullah had courted controversy with his remarks "PoK belongs to Pakistan". A few days later, the National Conference chief said Pakistan was "not weak and was not wearing bangles to allow India to take that part of Jammu and Kashmir under its occupation".